Evansville Community Theatre invites you to audition for Little Shop of Horrors. Auditions are scheduled for Saturday May 10th from 10 to 2 and Monday May 12th from 6 to 8. The cast is 4 male and 4 female roles as well as an ensemble. Call backs will be Tuesday May 13th. Auditions will be held at JC McKenna Middle School, 307 South 1st Street in Evansville. Those auditioning must be high school age or older. Please bring piano music and be prepared to sing at least 16 bars of any selection from a musical. Also be ready to read from the script. A prepared monologue will not be necessary. Script sides (excerpts) will be available at Eager Free Public Library and on the ECT website . Don’t want to be on stage but want to get involved? We always need lots of help for productions so contact us if you would like to get involved in community theater! There’s a Cat…In a Hat! In the background it has started–a production team meeting, the set designers have been meeting off and on for weeks–it can only mean one thing, a new show is on tap. 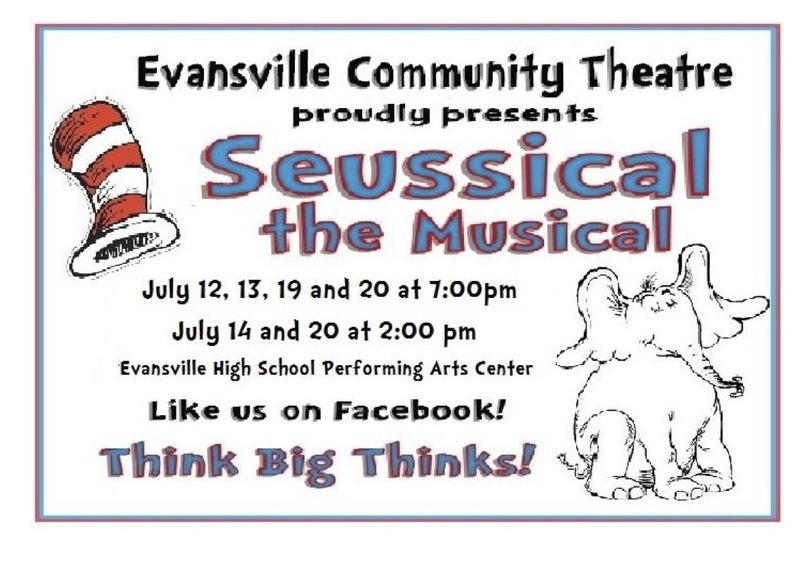 ECT proudly presents Seussical the Musical at the Evansville High School Performing Arts Center in July. Auditions are coming in May, so warm up your voice and watch the website for updates and audition details! Seussical the Musical is a fantastical, magical, musical extravaganza! Meet all your favorite Dr. Seuss characters, including Horton the Elephant, The Cat in the Hat, Gertrude McFuzz, lazy Mayzie, and a little boy with a big imagination — Jojo. The colorful characters transport you from the Jungle of Nool to the Circus McGurkus to the invisible world of the Whos. Seussical is fun for the whole family! Thursday, May 9, 6:30 – 9:00 p.m.
Saturday, May 11, 9:00 a -12:00 p.m. and 1:00 – 4:00 p.m.
Auditions will be held at J.C. McKenna Middle School in Evansville. Saturday auditions are over but on Tuesday September 11 from 6 to 9, ECT will be holding another audition for A Christmas Story. The auditions are at the J.C. McKenna Middle School. All parts, including the adult parts are open. The play calls for a cast of 2 men, 2 women, and 7 children. The roles for children are for 5 boys ages 7 to 15, and 2 girls ages 9 to 12. Anyone new to the stage is encouraged to audition; previous performers are also welcome to audition. Audition pieces are at the Evansville Public Library or will be available at auditions. Based on the classic movie featuring a Red Ryder bb gun as Ralphie’s coveted Christmas gift, A Christmas Story, adapted for stage by Philip Grecian, is a joyous celebration of childhood in the Midwest in 1938. Performance Times: November 30, 7 p.m.
December 1, 2 and 7 p.m.
It’s official, Evansville Community Theatre will be presenting A Christmas Story again this year. But the problem with plays that have kids is the kids grow up and we need new ones to replace them. So this Saturday, September 8 from 9 to 1 and Tuesday September 11 from 6 to 8, ECT will be holding auditions. The auditions will be at the J.C. McKenna Middle School. Your chance of stardom awaits! This Saturday, May 14th from 10 to 12 and 1 to 3, as well as Monday May 16th from 6:30 to 8:30, we invite you to audition for Fiddler on the Roof. Auditions will be held at the JC McKenna Middle School 307 South 1st Street, Evansville. You can find a map and helpful audition information, sample readings, character descriptions, and and other information at the ECT website. Click on the Fiddler poster to get to the audition page. Here’s what to expect when you get there. First one of our smiling volunteers will hand you a packet of papers to fill out–the usual things so our director and producers can get to know you, the waivers that the lawyers require including one that allows me, the friendly blogger to include you in pictures for both this blog and our website. You’ll be shown into the glamorous JC McKenna cafeteria where you will stop by and get your picture taken (by the writer of this blog). After your picture you’ll have time to fill out the forms and warm up your voice if you’re so inclined. 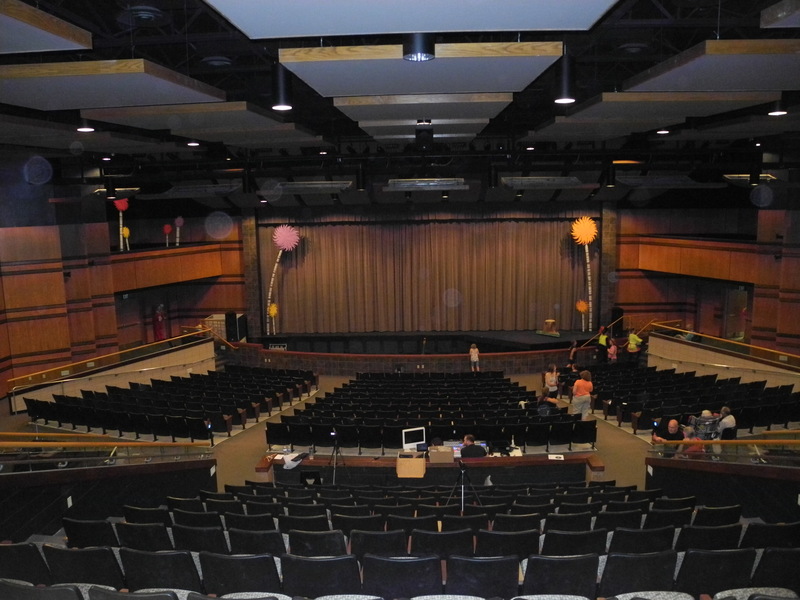 Next we’ll show you into the luxurious auditorium where the director and the producers will be waiting with bated breath to hear you read and sing. A handy sheet of tips from our director is here. 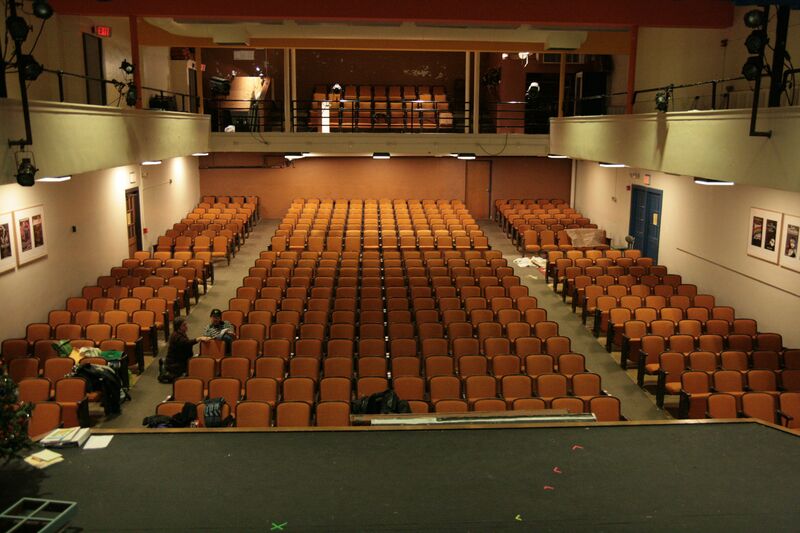 The McKenna Auditorium is quaint and capable but don’t get too enamored with the venue, it is only temporary until the school year ends. 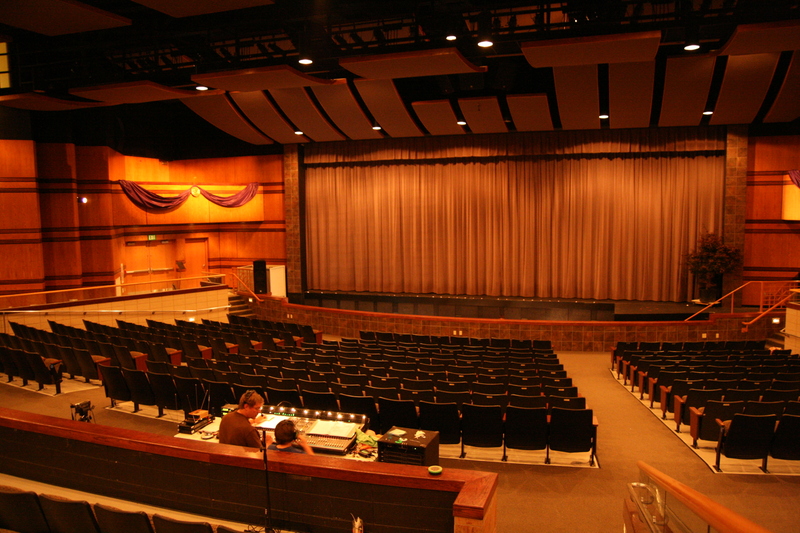 While early rehearsals take place at JC McKenna, as soon as the final events of the school year are finished the production will move to the Evansville High School Performing Arts Center. This is truly a beautiful venue and one the city of Evansville is lucky to have. After you’re done, the team will probably give you some words of encouragement and also tell you when to expect call backs. They will be happy to answer any questions too. My words of advice? Relax and have fun. While ECT prides itself in producing quality plays, we also pride ourselves in getting people involved and are always looking for new faces to join the cast. We are looking forward to meeting you this Saturday (or Monday) so come audition!